Sweet and hot (New Mexico) chiles! 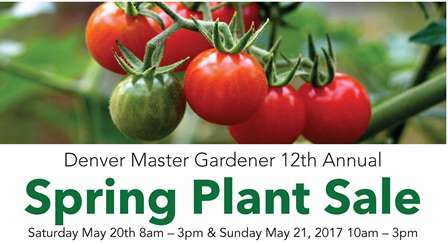 Gently-used gardening containers, tools, books and more! Where Does Baby Corn Come From? Posted on April 17, 2017 | Comments Off on Where Does Baby Corn Come From? A few weeks ago, one of my vegetable gardening friends asked me where she could buy seeds to grow baby corn. She thought the tiny rows of corn stalks would look cute growing in her elevated garden bed. She looked confused until I explained what I meant. Then we both had a good laugh. 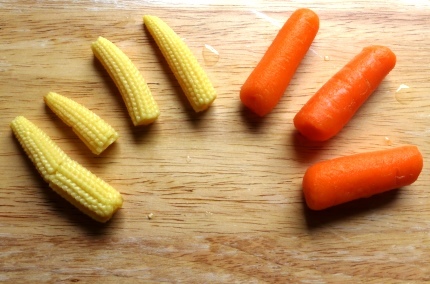 The baby corn found on appetizer plates and in stir-fry recipes isn’t a special variety of sweet corn. The tiny ears are the second ear from the top of regular sweet corn that’s been handpicked before the plant’s been fertilized. The top ear is left on the plant to keep growing into full size. Because handpicking little ears of corn is especially labor intensive, almost all the baby corn we eat is grown and harvested overseas in countries like Thailand. Of course, there may be a few industrious U.S. growers who grow and harvest the baby ears of corn to sell in their husks at farmers markets. But large farms steer clear of the early harvest because it can’t be mechanized. The packages of baby carrots at the grocery store aren’t a special variety of carrot either. Baby cut carrots start out as full-size, slightly imperfect carrots that are sliced into smaller pieces, run through a mill and then polished into perfectly round “baby” carrots. The idea for baby cut carrots came from one creative carrot farmer who was trying to find a way to increase carrot sales and reduce the amount of carrot waste from irregular or “ugly” carrots. The leftover carrot scraps from the milling process don’t go to waste either. They’re usually composted, used as animal feed or turned into carrot juice. The good news for vegetable gardeners is there are real baby carrots we can plant and grow in our gardens. These miniature varieties of carrots are sold in seed packets with names like ‘Romeo’ baby round carrots, ‘Baby Little Fingers’, and ‘Short ‘N Sweet’ carrots. As for growing baby corn, you can always plant any variety of sweet corn and then start picking those little ears just after the corn silks emerge and before they have a chance to grow. Comments Off on Where Does Baby Corn Come From?